Beautiful, spunky, 30-something Amelia Moore owns the successful Moore Detective Agency specializing in missing persons. Her sometime work partner is private eye, Rick Bonito, who also happens to be handsome and charming. 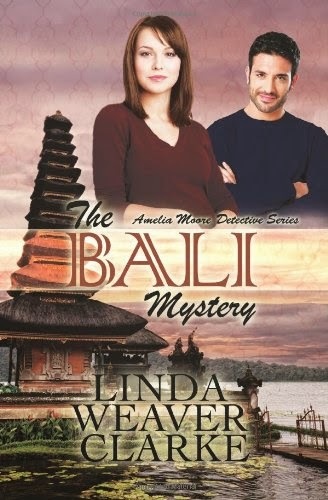 Together they embark on an intriguing case that takes them to exotic Bali, Indonesia. The author reveals interesting elements of Indonesian society. The Balinese are a religious people, as evidenced by the over 20,000 Hindu temples on the main island, one of which figures in this story; also Indonesian law requires that everyone hold an identity card on which is written the person’s religion. Not a concept that would endear North Americans. Moreover, blasphemy is illegal and you can be arrested for profanity! Graceful, elegant Balinese dancing described in the book features the telling of a story through fingers, hands, and body gestures, including head and eye movements. And who wouldn’t want to go swimming with the dolphins in the turquoise-blue waters of Bali. Lotus and jasmine flowers, lush vegetation, swaying palm trees and beautiful terraced hillsides in which rice is grown completes the picture of a romantic, exotic escape. Not to mention that Amelia is forever humming tunes from the musical of the 1950’s, “South Pacific” set in the mystical island of Bali Ha’i. The author, Linda Weaver Clarke, has become a prolific writer of clean reads. This is the second of her books that I have read and enjoyed. This is a cozy mystery, but there is also suspense, danger and, of course, romance. Throw in two mysterious men in black – complete with black suits and sunglasses (remember Tommy Lee Jones and Will Smith?) - a beautiful Pakistani woman, an assassination plot, the CIA, and you have all the makings of an exciting novel. I highly recommend The Bali Mystery.